The most ambitious of Jefferson's fencing schemes was the ten-foot-high paling fence. The fence extended nearly three quarters of a mile around the entire vegetable garden and south orchard. It was secured with a lock and key and was meant to keep out deer and other animals as well as any people who might wander by and otherwise help themselves to the fresh fruit and produce. 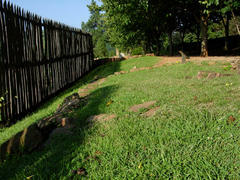 The course of the fence depicted here is based on an 1809 survey plat by Jefferson. Modern archaeology only uncovered evidence for this fence from the Weaver�s Cottage to the western end of Mulberry Row and then south to the Second roundabout. Evidence for an earlier fence was also discovered.